Yes, neon lights adorn the theater marques announcing all the best Broadway plays – but did you know that “Broadway” refers to any one of 40 Broadway Theatres in NYC? At Off-Broadway theaters – and Off-Off-Broadway theaters – in New York City, you’ll find innovative, prize-winning plays, smash-hits, and small amateur theater performances. And, many of their headliners are big-name stars or up-and-coming playwrights who like to work in hip, intimate venues. Lincoln Center Theater, named “the pre-eminent theater in the country,” by The New York Times, strives to keep ticket prices low in an effort to make outstanding theater productions accessible to all. At New York theaters all around the state, you can see stellar performances of comedy, drama, musicals, experimental plays and children&apos;s theater. Expect to be dazzled by top-notch stage productions, often presented in restored historic theaters, summer repertory barns, and pleasing outdoor settings. A group of community members transformed an abandoned supermarket into Capital Repertory Theater over 30 years ago to create Albany’s first professional resident theatre. 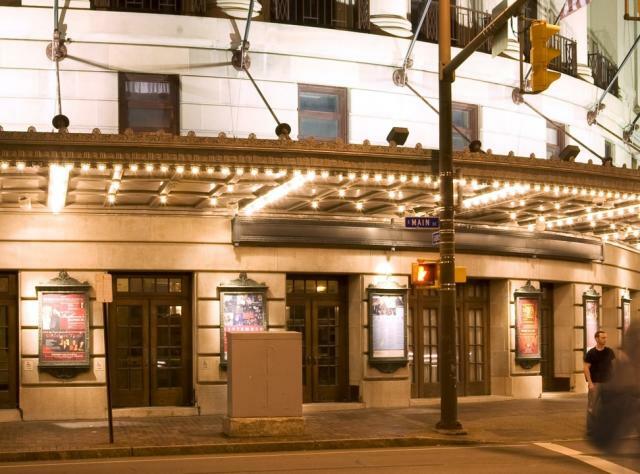 You’ll find both excellence and variety in premieres and award-winning plays at this 286-seat downtown theater and café. In Schenectady, Proctors is a beautifully restored historic theater on the National Register of Historic Places: it is renowned for Broadway touring productions, music and dance performances, comedy and children’s programs. Other opulent Vaudeville-era theaters in New York offering top-rated productions include The Forum Theatre in Binghamton and Shea’s in Buffalo. And, The Arena Players Repertory Theatre Company on the North Shore of Long Island presents their main stage productions at the Vanderbilt Mansion’s lovely Carriage House Theater. A strikingly modern building designed by Frank Gehry, The Richard B. Fisher Center for the Performing Arts on the campus of Bard College, encourages risk-taking, provocative performances in all the arts. Or, for a bit of nostalgia with an enjoyable theater experience, the Lucille Ball Little Theater, the largest community theater in New York, is where the queen of TV comedy played her first professional role in 1930. Art Park and its amphitheater sits atop the Niagara River Gorge in a New York State Park and was created with families in mind. It offers Broadway musicals, concerts, summer music camps for youth, plus hiking, fishing, and picnicking areas. Merry-Go-Round Playhouse Musical Theatre, aka “Broadway in the Finger Lakes,” presents large-scale musicals in a historical building where the carousel once whirled. If Shakespeare under a tent on the lawn of an early 19th-century Federal mansion, with a backdrop of mountain and river views sounds appealing, then the Hudson Valley Shakespeare Festival at Boscobel is perfect for you. Bring your own picnic or enjoy prepared foods; you may also tour the mansion. Want more theater in the Catskills? There’s The Woodstock Playhouse and, at Forestburgh Theater, in addition to main stage musicals and children’s theater productions in a 19th-century barn, you can enjoy pre-show and post-show cabaret and refreshments in the adjoining Tavern. It’s true: all of New York’s a stage!